A California high school teacher, who also serves as a reserve police officer, has been placed on suspension after injuring three students. 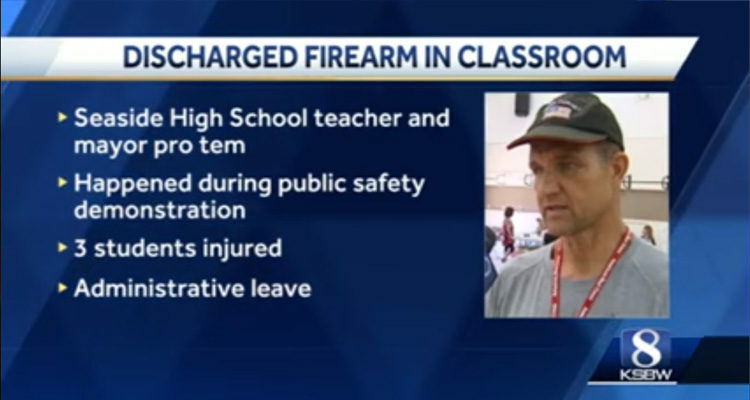 NBC affiliated television station KSBW reported that a Seaside, California, high school teacher accidentally fired his weapon while teaching gun safety to students at Seaside High School. Three students were injured, including a 17-year-old boy who was hit in the neck by debris or a fragment after the bullet ricocheted off the ceiling, said Seaside police Chief Abdul D. Pridgen. The boy was not seriously injured and classes resumed, the Herald reported. The shooting occurs amid intense debate over whether to arm teachers in the wake of the Parkland, Fla. shooting that left 17 dead and another 17 injured. On Wednesday, students across the country are set to walk out of their classrooms to raise awareness about gun violence and safety. Alexander has taught the course in the past but Pridgen said he doesn’t know if he’d ever brought a live firearm to the school before. An investigation is ongoing and Pridgen said the police department will handle the situation like any other investigation. “We’re looking into any violation of city ordinance or the penal code and we’ll determine whether or not there are any applicable charges,” Pridgen said. The letter also stated that the school district is unable to share any other details other than Alexander has been placed on administrative leave for the duration of the on-going investigation. He has apologized for the incident according to KSBW.